Urban Routes the Sweet Spot, Staples Manager Says; Like Driving in a Reclining Chair? Payette says that maintenance costs for the electrics are only just half those of traditional trucks or less, as the powering system is much less complex. 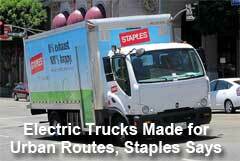 Office products giant Staples says its still relatively small but growing fleet of all-electric delivery trucks is working out well operationally and financially for the company, with that success coming from picking the right applications and markets for the Green trucks. So says Mike Payette, director for fleet equipment at Staples, in a recent article on the truckinginfo.com web site. Just 53 out of Staple's nearly 1800 delivery trucks across the globe are Smith Newton battery-power electrics. But those 53 are working so well that Staples will soon add five more and likely will bring in additional electrics as leases end on Staples' conventional trucks. But you have to pick your spots, Payette says. truckinginfo.com. "That's where they shine and deliver the savings." So far, Staples has deployed the electrics in just eight cities across the US. The best fit, not surprisingly, are on routes that include lots of stops and limited miles per day. That way, they can keep under the daily maximum mileage, usually said to be about 75-100 miles per day but rising. One Staples route in LA is actually just 35 miles on average, and that truck only needs charged every other day. Payette says it has some electrics on routes as long as 120 miles, but noted that over 65 miles the scale starts to tip towards a traditional diesel truck. The electrics certainly cost more to purchase than a traditional delivery truck, but federal and state incentives can often eat away at a significant portion of that initial cost delta. But then less expensive fuel costs and much lower maintenance costs can be brought in to provide a solid enough ROI while helping meet sustainability goals. "The truck has to carry its own weight," Payette says. "It has to pay for itself, justify itself and fit in the fleet profile. We don't place it on an artificial route created for it; it runs a regular route." A diesel might burn 8 gallons of fuel worth $32 or more compared to $6.50 to recharge an electric truck's batteries for the same route length. Staples, where it can, has a battery charging system that kicks on when off-peak rates are available, such as 9:00 pm, with charging times for a depleted battery taking some 4 hours. Payette says that maintenance costs for the electrics are only just half those of traditional trucks or less, as the powering system is much less complex, with no engines, transmissions or drivetrains in the normal sense. Truck makers for this class of vehicle also continue to make power systems more effective and reduce the weight of batteries and other sub-systems, which is servicing to increase net loading capacity. And drivers love the electrics, Payette says. "Once they're in one, they never want to drive a diesel again," Payette told truckinginfo.com. "Ask any driver out there. It's a peaceful experience. Traffic doesn't bother them. There's no vibration, no noise, no odor; they compare it to driving a recliner chair." Or maybe a playing a round of golf? What is your experience in operating or looking at electric trucks? Let us know your thoughts at the Feedback button below.